Ideal for securing and sealing boxes, parcels and other packages, this Q-Connect polypropylene tape provides strong, waterproof adhesion to help protect items in transit. 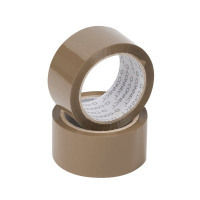 Suitable for use with a compatible tape dispenser, each roll measures 50mm x 66m. This pack contains 6 brown rolls.